Where do I use my Hurley voucher code? Browse all the latest deals at NetVoucherCodes and find an offer you wish to use. Click onto the Hurley website and start browsing. Add items to your basket then review your shopping bag. Enter your code in the ‘Discount Code’ box and then click ‘Apply’. Select ‘Pay With Card’ to finalise your transaction. "Huge savings in the sale section." Hurley is a family owned business since that has been operating since 1955 and was The Original sports shop in Manchester City Centre. They won the Draper’s Award for ‘Young Fashion Retailer of the Year’ in 2010 and are is now regarded as one of the North West’s leading independent Branded Fashion retailers for men, women, girls and boys. 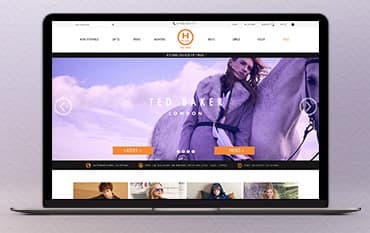 Their online store offers all the latest styles from leading brands such as Vivienne Westwood, Armani Jeans, Ted Baker, Barbour, Boss, Fred Perry and much more. Every so often Hurley will issue a Discount Code offering great discounts on select items or money off a minimum spend or sometimes free delivery. Here at NetVoucherCodes, it is our job to make sure that you are kept informed of all these discount codes and any other money-saving deals, offers and sales at Hurley, so can dress to impress for much less. There's a fantastic choice of T-shirts at Hurley for men, women and children from some of the most popular fashion brands like Barbour, Boss Orange, EA7, Armani Jeans, G Star and much more. Little girls will love the pretty T-shirts from Billiblush and boys in the Armani Junior and Boss styles on offer. How can I find my nearest Hurley store? To find your nearest Hurley store please use the store locator that can be found here. You have 30 days to return a product to Hurley, provided the products are still in their original condition. How can I contact Hurley? Get different brands all in one store when you shop at Hurley. Grab one of our Hurley Discount Codes for great discounts and the hottest deals. Find popular designer brands who are known for their style and quality available. The store keeps stock of wetsuits, clothing, footwear, and accessories for every size to outfit everyone in the family.